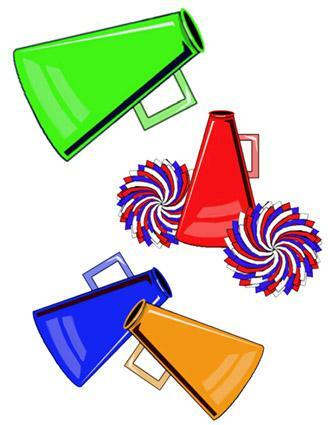 If you're planning a website to document your squad's cheer career, or you just want to create a team homepage, you'll want to use some megaphone clipart. You may even want to create a nice flyer or newsletter for your fans. Whatever your needs, there are many different versions of megaphone clipart available to dress up your desktop publishing items and give a shout out to increase school spirit. A big part of cheering is having a big voice, and cheer megaphones can help even the softest spoken cheerleader accomplish this task. Megaphones play a vital role in helping cheerleaders get the crowd excited. An excited crowd can help motivate the team to play their best game. There are several different types of clipart and graphics featuring megaphones. If you need help downloading any of the clipart below, check out these helpful tips. Another option is taking photographs on your own. Line up objects to go with the megaphone or take an image of the megaphone on a solid black or white background. Your imagination is the only limit on how many different megaphone photographs you can snap with your camera. Although sometimes overlooked as possible clipart options, if you can't find the exact megaphone clipart of your dreams, consider having an artist draw the clipart for you. This allows much more freedom, and you can add details such as your team mascot or logo. Drawing your own clipart also allows you the ability to make the image in the size and colors of your choice. If you are in high school, perhaps a student from the art class would help. Ask family and friends if they know anyone skilled at drawing. Crowd Cards: Place an image of a megaphone on a card to encourage the crowd to cheer loudly for your team. Lift the card up, and shout a chant that the crowd can repeat. Better yet, have a cheerleader with a megaphone help the crowds shout encouragement. It just might mean the difference between victory and defeat. Newsletter: Most squads these days have fans just like the sports teams do. A newsletter can keep parents, other students and fans posted on what the squad is up to. and some nicely scattered clipart can really add a professional touch to the newsletter. Add a shout out section with the image of a megaphone, and give kudos to those cheerleaders who have recently excelled. Website: Megaphone clipart used on a website can remind visitors about important events or competitive wins the squad may have participated in. Uniforms: Some uniforms feature a megaphone. This is where custom drawn graphics featuring team colors, letters and/or logos can come in handy. This will allow you to use the same megaphone logo on all of your team's correspondence, uniforms and elsewhere, creating a uniform look. Face Painting: Encourage fans to paint the squad megaphone on their cheeks to show their support for the team and the cheer squad. With so many different options for clipart, you're sure to find the perfect megaphone to suite your needs. Whether you choose free stock clipart, a snazzy photograph or a more detailed and customized drawing, clipart can add a lot of pizzazz to your newsletters, website and other team correspondence.